"Finding Dory" got off to a great start last weekend by shooting to the top of the chart with over 800,000 admissions, but two new features have since entered the fray and pulled ahead of Pixar's latest adventure. "Now You See Me 2" by Jon M. Chu and Yeon Sang-ho's "Train to Busan" were released last week and claimed the top two places over the weekend. 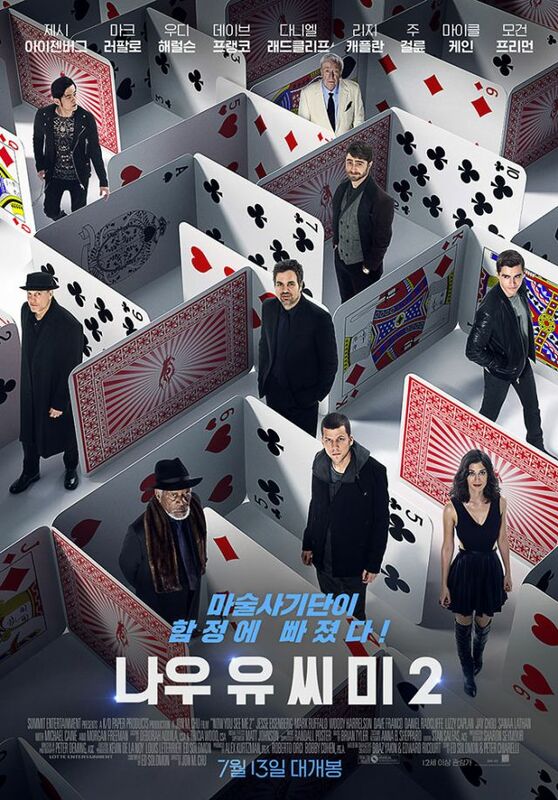 "Now You See Me 2" captured 36.1% of the box office pie (1 million admissions) across a whopping 1,200 screens to end up as the undisputed winner, followed by Yeon's action thriller with 559,054 admissions (19.26%). "Train to Busan" is Yeon's first live-action having already directed a number of animated features that includes "The Fake" (2013), "The Window" (2012) and "King of Pigs". Pixar's "Finding Dory" was bumped down to third place after a strong opening weekend last week; surprisingly, and despite having more than double the screens that Yeon's latest was given, "Finding Dory" claimed 525,144 admissions across 969 screens. With those numbers consider, "Finding Dory" has banked $12.6 million (1.7 million admissions) in Korea alone. Worldwide, "Finding Dory" has grossed an impressive $721.7 million. Park Dae-min's period piece "Seondal: The Man Who Sells the River" (starring Yoo Seung-ho, Cho Jae-hyun, Ko Chang-seok and Ra Mi-ran) was next in fourth place with 414,413 admissions (13.6%). Park's comedy was released July 6, and, like "Find Dory", it enjoyed a strong opening weekend last week (it came in second with 28.9% of the sales), but was denied a podium place here due to the popularity of this weekend's winners. "Seondal", Park's second film after the 2009 mystery thriller "Private Eye", has grossed nearly $13 million (1.8 million admissions) and is on track to overtaking Park's debate film in terms of total admissions. The American survival horror "The Shallows" by Jaume Collet-Serra also arrived in Korea last week, and from the 518 screens allocated to it, the film claimed 5.3% of the total sales (156,367 admissions). Last weekend's number three, Kim Tae-goon's comedy drama "Familyhood" starring Kim Hye-soo and Ma Dong-seok, dropped three places to fifth with 128,806 admissions (4.3%); "Familyhood" has now moved its total tally to over 2 million; or, $14.4 million. The admissions dropped off sharply from seventh place onwards: "Demolition" (a comedy-drama film by Jean-Marc Vallée) attracted 15,605 admissions (0.5%); Lee Chang-yeol's thriller "Trick" (starring Lee Jung-jin, Kang Ye-won and Kim Tae-hoon) captured 14,269 admissions (0.5%), and the German comedy "I'm Off Then" by Julia von Heinz saw 11,055 tickets sold (0.4%) during its first weekend out in Korea. Lastly, David Yates' "The Legend of Tarzan" occupied tenth place with 10,074 admissions (0.3%), and so moved its total tally on to 854,476 ($6.3 million). Yates' re-imagining of the classic story of Tarzan has struggled worldwide: the film was produced for an estimated $180 million, but so far the film has only managed to gross around $193.7 million.